In many cultures the butterfly is a symbol of hope, endurance, change, and new life. Which means this card will be perfect for almost any occasion you want to send happy thoughts or say, “I’m thinking of you.” The Butterfly Wishes design can be stitched in two sizes for 5 x 7 or 4¼ x 5½” cards. 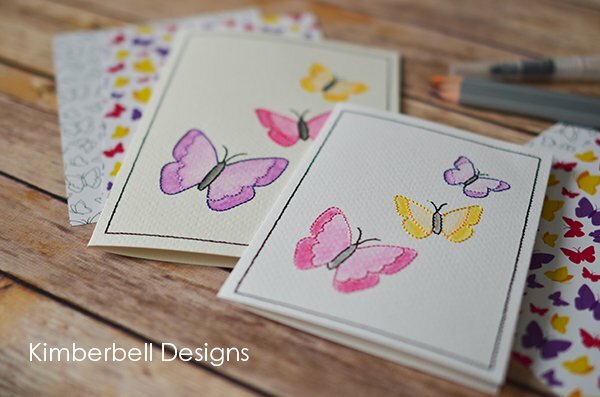 After embroidery, add shadows of color with Kimberbell Watercolor Pencils, then use the blending brush to smooth the pencil lines into brushstrokes, giving a wash of color to each dainty wing. Materials Included: Kit includes design and all products needed to complete the project.